Many WISPS start out with a bridged/switched network. It's cheap and easy to create (simply plug stuff in!) but doesn't scale well. Sooner or later, the only way to scale up is to scale out — using routers, not just switches and bridges. I learned the practical limits of spanning tree the hard way, somewhere around the last century. Since then, I've been a proponent of Routing All The Bits. So for me, moving back to 'switching,' even on a small test network segment, felt a bit grungy. 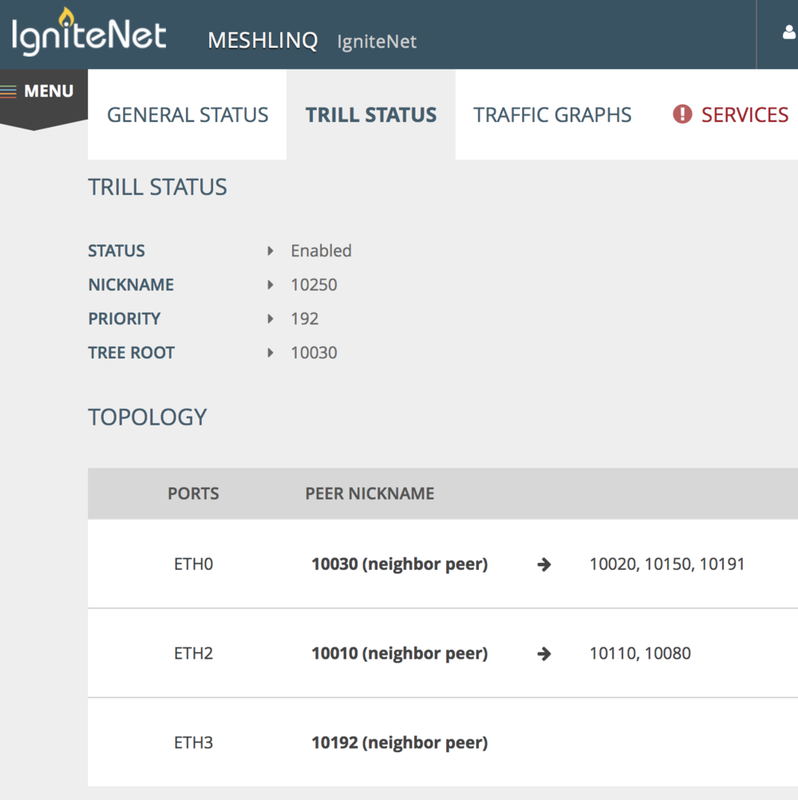 We'll test a mesh of up to 10 TRILL switches from IgniteNet in a real deployment. In Part 1, we saw that TRILL is an overlay network. It's actually a routed network underneath. In practice, it should be more efficient and resilient than a traditional bridged network. Here in Part 2 we'll talk about how to configure TRILL (it's almost zero-config), and what effect it has on traffic paths. SPOILER: it picks the shortest path. We'll use a physical backhaul network of wireless and wired single links. 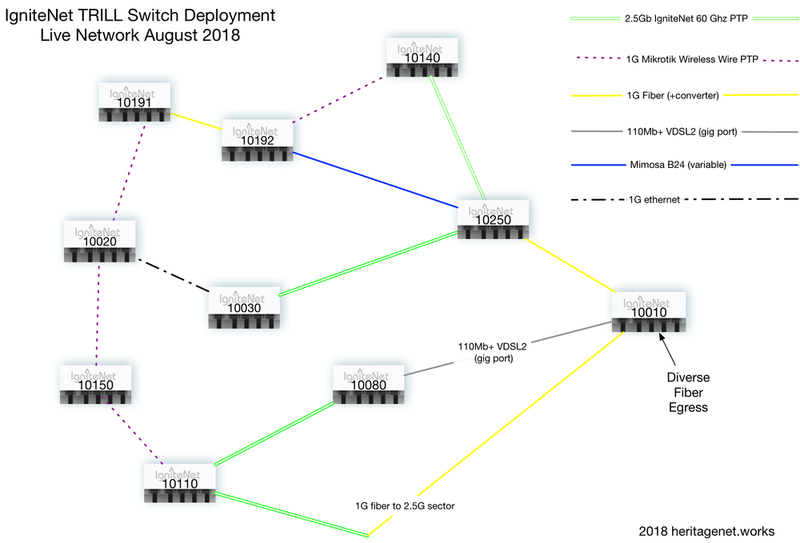 We can use non-TRILL switches as well as TRILL switches; if a TRILL port sees Spanning Tree BPDU packets, it lets STP do its thing and steps out of the way. Consequently, we disable STP wherever we want to use TRILL to manage loop-free topology. To augment testing with sub-gigabit connections, I added an SFP VDSL2+ link that tops out at about 110Mb, converted to a 1 Gig copper interface. Each POP or hop contains a minimum of two backhauls or interconnections, a TRILL switch, and a router. We'll get to the routers in part 3. Each port needs to be designated either as an access port (accepting untagged and VLAN frames), or as a trunk port — encapsulating traffic between switches so they can be routed instead of bridged. You can configure ports as access or trunk as needed. Your payload connects to an access port. You might connect a router (as I did), or even another Layer 2 segment. TRILL switches run a link state routing protocol, IS-IS, on the trunk ports. IS-IS requires no additional IPv4 or IPv6 configuration. Runtime state and debugging is available via CLI. On trunk ports, a TRILL adjacency forms between neighbor peers. If you look at the switch IDs on the deployment link map above, and compare it to the TOPOLOGY section of this status screenshot, you'll see that the TRILL switch with nickname/ID 10250 has an optimal path to every other peer — from its perspective in the mesh. 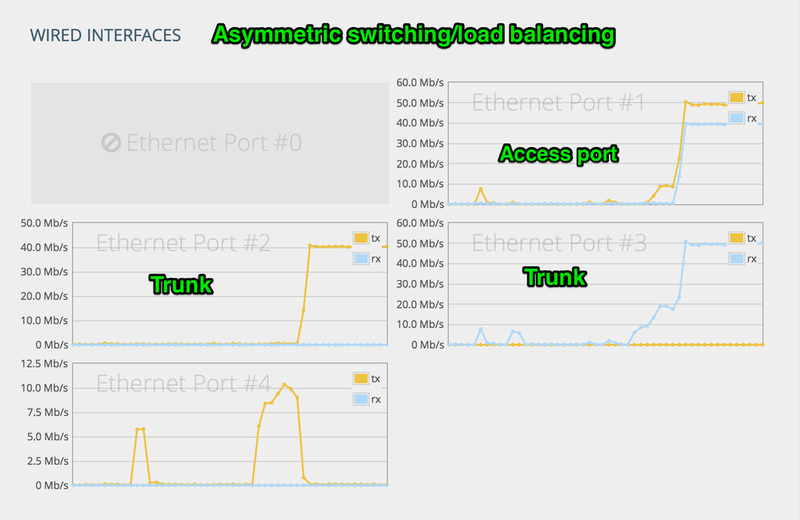 STP (spanning tree) needs to be disabled on all bridging devices and backhauls that connect a trunk port to another trunk port, or TRILL does not form an adjacency — instead, it falls back to Layer 2 switching. 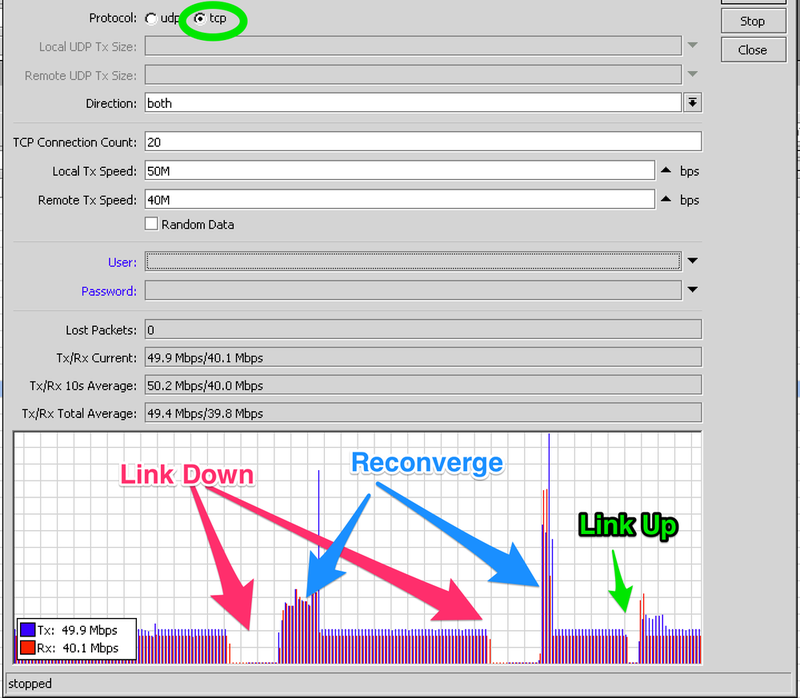 With the latest firmware, convergence occurs in 6-8 seconds on a link-down condition, and even faster on a link-up condition. The IgniteNet implementation of TRILL does not yet support multipath/ECMP. However, assuming port speed and metric are identical, TRILL prefers the first or lowest interface with the shortest path to the destination. In this example, note that TX and RX are split across trunk ports #2 and #3. We can exploit this effect to balance traffic across multiple half-duplex radio links — without any additional router or switch configuration needed. These views are my own; IgniteNet did not sponsor this post, but did answer copious questions during the debugging and trial phases.